Hi, i'm having problems with consistency of finding the correct scale when building with unimog tires (Tire 94.3 x 38 R) are you building on the 1:10, 1:12 scale or 1:11 scale? The unimog tires are about 4 1/4 inches in diameter. 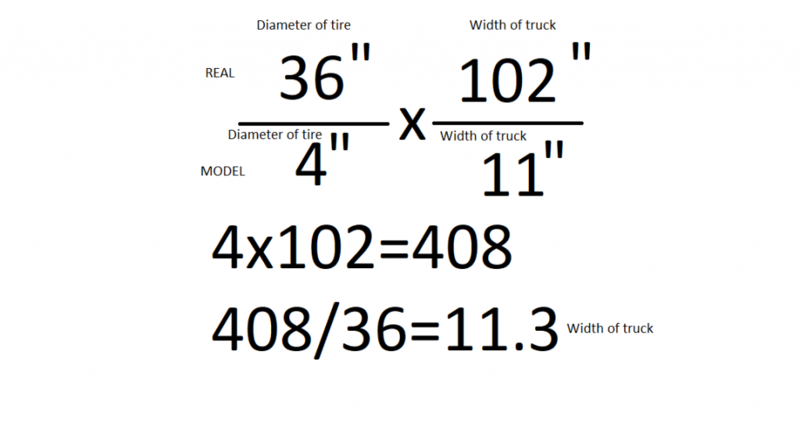 Some semi tires are 22 1/2 and 36 inches in diameter. A semi is about 8 1/2 feet wide. First, it is necessary to know which type of Unimog you aim to build, for exaple U 2xx tire size is from 295/60 R22,5 to 425/75 R20, while U 5xx it is 305/70 R22,5 to 495/70 R24. So after you pick desired machine calculate the overal tire diametr = width*profile*2 + disc diameter. For 295/60 R22,5 it means 295*0,6*2 + 22,5*25,4 = 925,5mm. Then divide this number by diamer of lego tire - 925,5/94,3 = 9,8 and that is scale (1:9,8). You can see that the width of tire 295mm in scale 9,8 is 30mm so the lego tires are much wider. So it might be necessary to try different types of tires to get correct diameter and width as well, Unimog can be fitted with huge number of tires so you might end with scale 1:9 to 1:11 easily. Once you figure the scale you can convert the other dimmensions, if the width of U216 is 2820mm so in scale 1:9,8 it is 288mm ie 36 studs.